Happy Friday! Here's a bunch of photos for you to enjoy! A little sweetheart of a monkey, helping Raynor to raise money for charity. 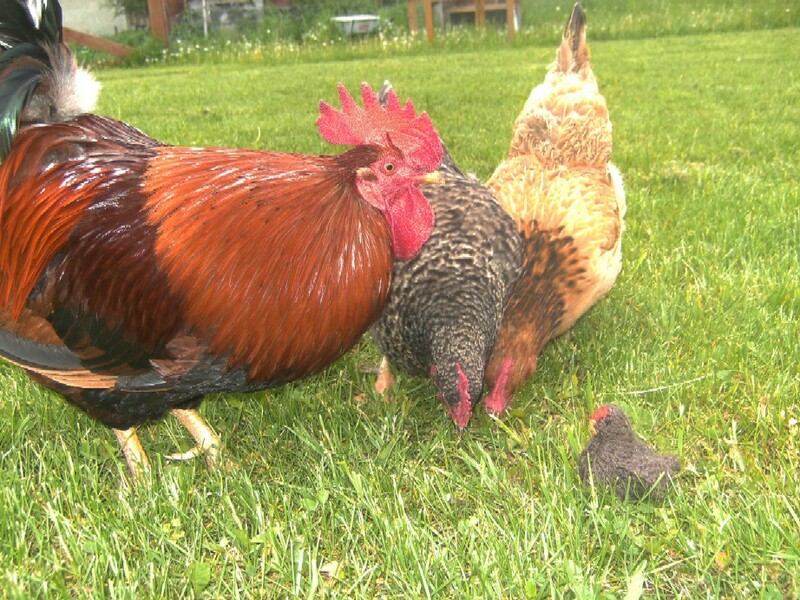 If you look closely, you'll see one of these hens is not like the others. 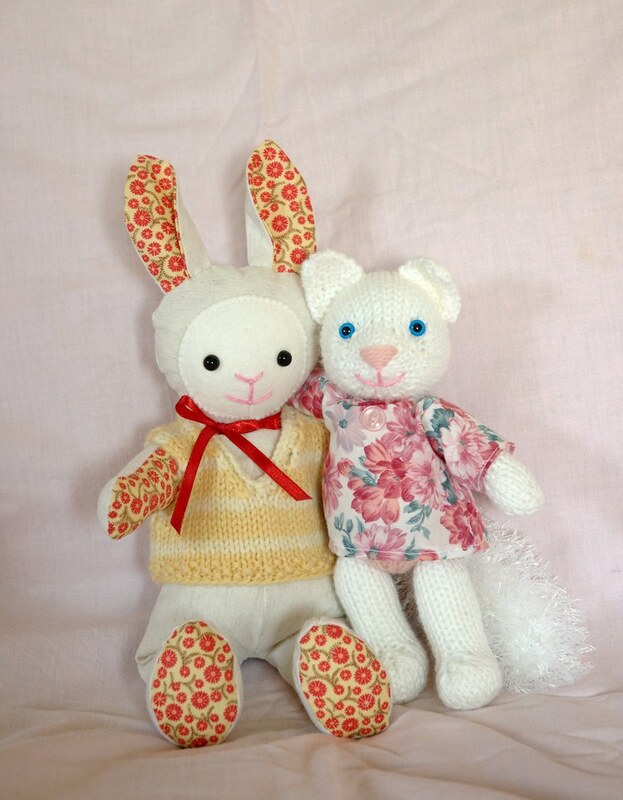 Jacqui has kindly let me design a jumper based on the pink lamb one. I have a lovely diagram drawn up, now I just need the courage to attempt the intarsia! Finally, a wee cow by Grace of Kathryn Ivy, proving that a cow is not made of spots alone. (Whatever that means... I just ran out of clever things to say, but I do love this little guy!) Here's the post about how to make the cow's nose pink. I spent all day taking photos and listing everything in my Etsy shop. I didn't think it would take so much time! I didn't get to do anything else today, except run by the post office so I have packing stuff to mail the kits, once people buy them. I wonder if they will sell as quickly as the last ones? I even gave up some of the yarn I dyed for myself for a few of the kits. 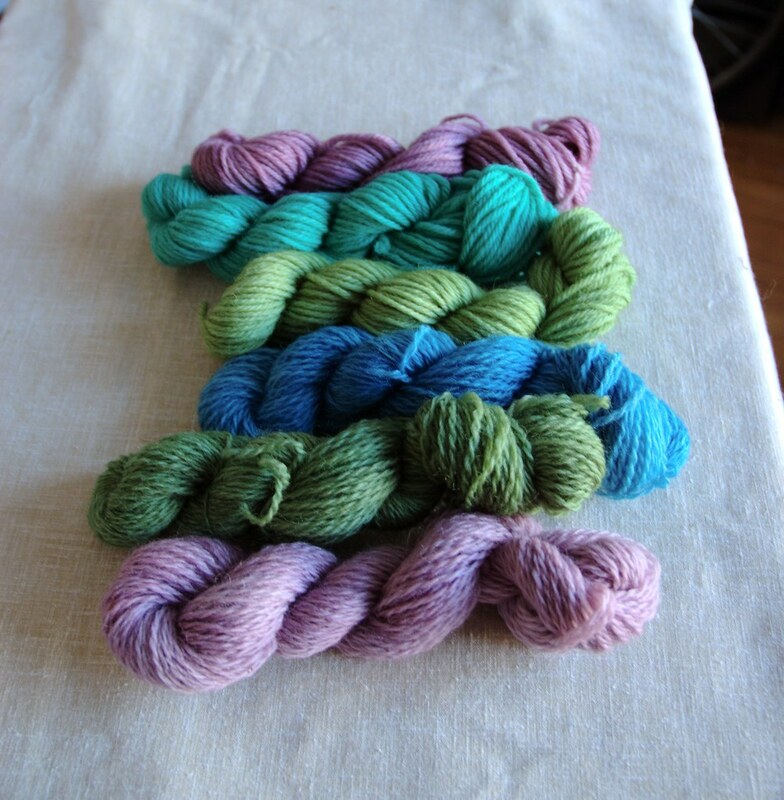 One of the kits has some lovely green/blue/lavender variegated yarn that turned out so pretty. I've already knit one little sweater from it (which is waiting for a toy now), so someone gets the rest. I wrote some stuff in my shop announcement, but I don't know if anyone reads it. 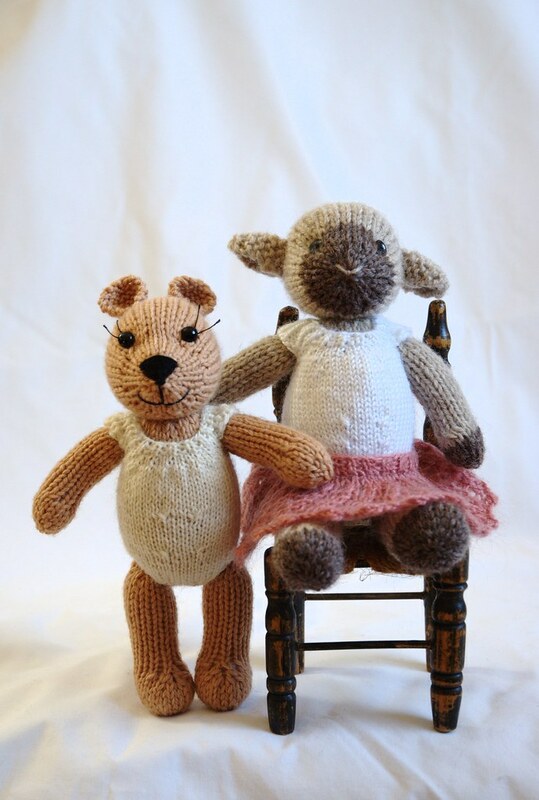 So, if you really like one of the kits, but don't want the book and/or yarn, please send me an email. 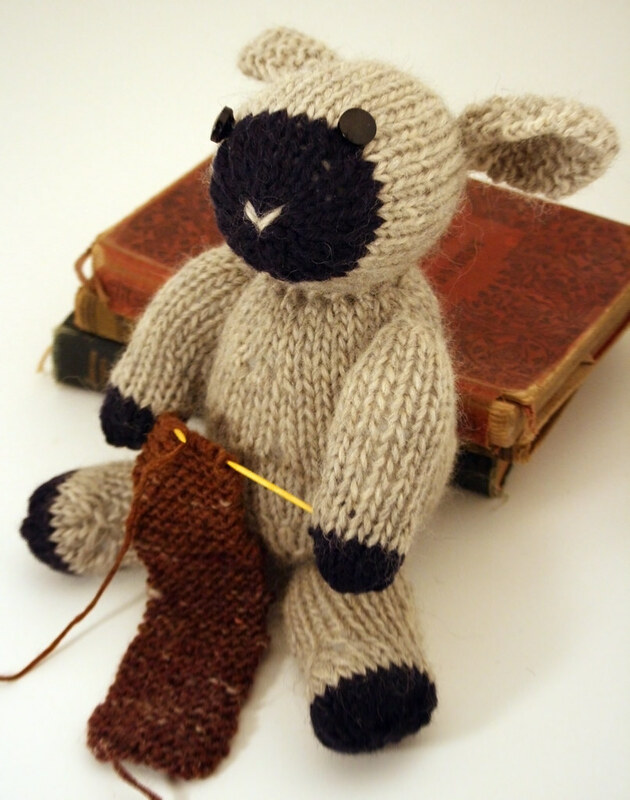 I'll refund the difference to you, and just stick the left-over book or yarn into another kit. If I sell a few kits over the weekend, I'll sew some bags next week and list a few more. The awesome green bag with the giant trees on it sold super fast, but luckily I have more of that fabric. I swear, tomorrow I'll post about something totally not Etsy related! I think I should post a bunch more of your toy photos, since I've skipped a couple weeks. I know it's been a couple weeks since I posted any photos of toys made by you. I've had some trouble contacting people to find out if I can use their photos. So from now on, I'll just assume that if your toy photos are in my flickr group, I can use them here (and give you credit, of course). That way I don't have to wait to post about a toy I really like. I could write tons more, but I think I'll save it for later in the week. Happy monday, everyone! So here's the big surprise: another give-away contest! In celebration of my birthday, and the un-birthday of everyone not born on this day, I'm giving away one of my toys. 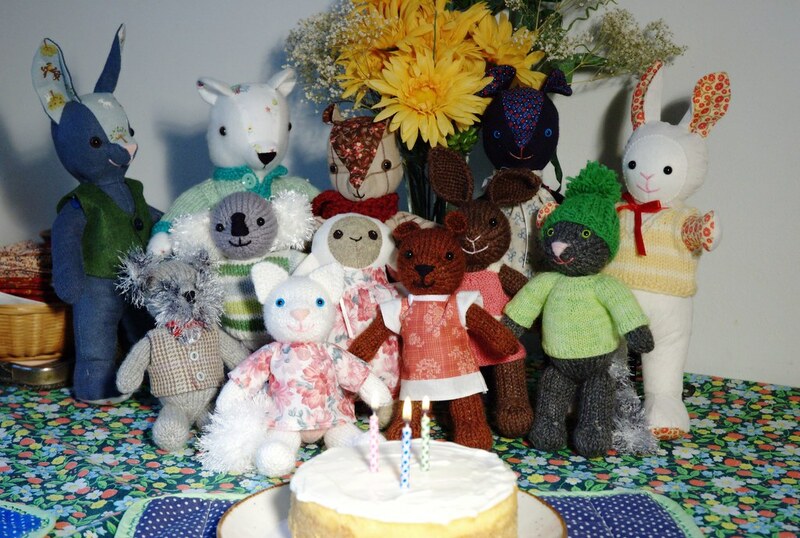 If you win, you get to choose one of the twelve cuties in the photo (but not the cake, it will shortly be consumed). To enter, all you need to do is leave a comment on this post, telling my about a very special birthday present you received. It could be something you got as a kid or as an adult - anything that really sticks out as a gift that was super awesome, made you smile or cry (in happiness), or was just exactly what you needed at the time. Don't think too hard about it! I just thought I would ask, because I think good things are better when shared :) For example: my most special birthday present ever was being asked to marry my sweetie, which happened just after my birthday last year. Also, please leave your name with your comment, and email address if you feel safe doing so. It would be difficult to give something to "anonymous." The contest will end next Sunday (May 25) at midnight. The winner will be randomly chosen, and announced here the next day. I'll also send the lucky person an email (if I can). P.S. I am now on Twitter as fuzzymitten. Please add me to your list, if you feel like keeping up with what I'm doing. Also, the pdf file for the Fuzzy Knits cover is now available from my website. I thought this method would be much easier than emailing it to those who remembered to ask. I'm silly and should have checked the blog of the place that's holding the craft fair. Looks like we didn't make the cut. I'm disappointed, as I think my work is professional enough; but it looks like they wanted stuff that is more edgy and trendy, rather than cute and cuddly. However, I hold firm to my desire to make things they way I want, and not give in to trends. Maybe next time I will have better luck. What this means is that I will have more time to work on new projects. 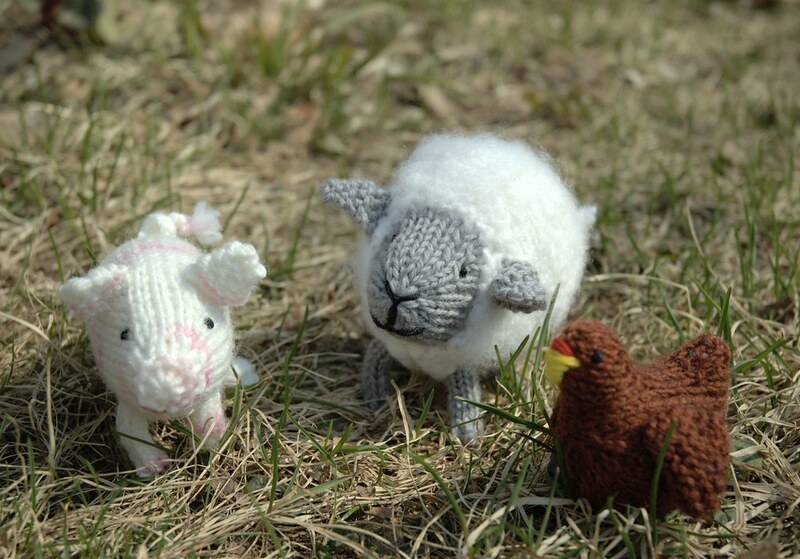 The fuzzy farm animals are almost done with their testing, so that pattern should be ready soon. I have one new animal I want to start working on right away, and nearly every week someone asks me to add another to my list! Also, I have a special surprise planned for my birthday, so remember to check in next week so you don't miss out! Edit: I'm a terrible friend. I forgot to link to my friend Allison, who was going to share a table with me at the craft fair. She also has an Etsy shop, where she sells lovely cards and photo prints. I was supposed to hear by now if I got into the craft fair. Maybe my partner was just busy today, and didn't forward the email. I haven't totally given up yet. On the other hand, it means I wouldn't have to work like mad over the next 6 weeks in order to make enough toys. Well, I'll keep busy tomorrow so I don't worry too much. I made another fabric toy today: a denim coloured bunny with a dark green vest. He's very chipper looking, and was named Sven by my husband. He has no explanation for the choice, but it stuck. I have come to the conclusion that my choice of fabric determines the final shape and character of the head. It something useful to know, so in future I can choose the right fabric for the toy I want to make. I finished reading "Bridget Jones' Diary" this evening (I know, super exciting life I lead, isn't it? After that, we watched an episode of Star Trek) Can't understand why I've never read it before, and now want to watch the movie again (and not just to see Colin Firth). Has made me write with no nouns to start my sentences. If you look to the right there, you will see a poll. I've been thinking about the kits I make, and whether there was something else, something better, I could be doing with them. 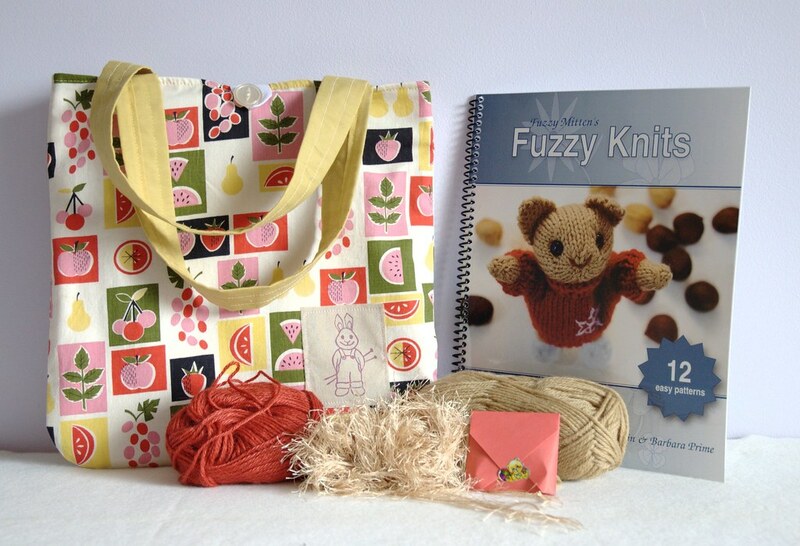 So, do you like the kits I've been offering so far, with a book, tote bag, and generally plain yarn to make one toy? 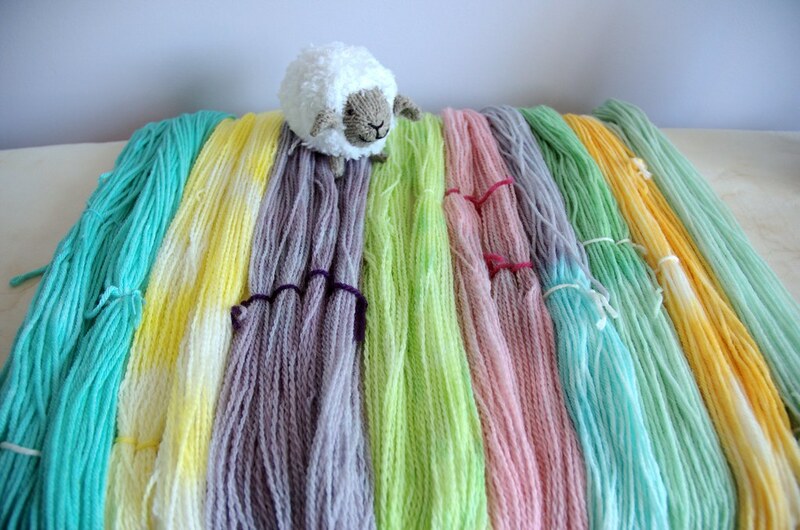 I've been thinking that maybe most of you could find some plain yarn for the toy on your own, and would enjoy the hand-dyed yarn more. It would also be more fun for me, matching the yarn to the tote bags. Plus, it would make the kits a little more unique, rather than just coming with some generic brown wool. On the other hand, I could just offer the book and tote bag together, and let you get your own yarn. So please vote, and leave a comment if you have some other suggestion. 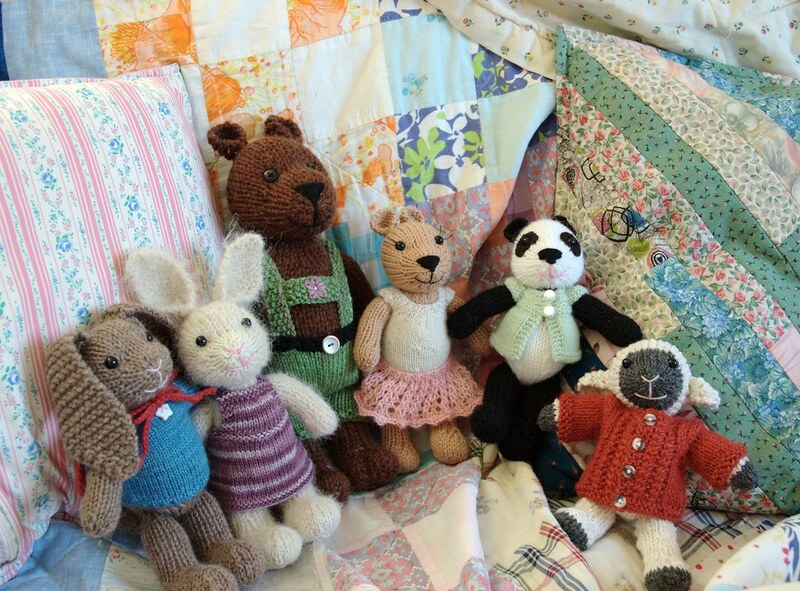 When I have a bit of time, I've been working on the fabric toys. I spent all morning one day last week, trying to design a different style of head, nearly ending up in tears. I think I'm missing some special gusset-designing gene, because I just can't get it. My new toy designing book was no help, either. Anyway, I eventually went back and modified a different head pattern. You can see I have two more toys now. I'm not sure what the blue toy is, maybe another mouse. She doesn't even have a name yet. Neither does the polar bear. I really like him, not just because he's made of snuggly fleece, but also because I finally figured out how to make the nose wider. I also added a bit of black fleece for his nose, which actually made it slightly easier to sew in the head gusset, because I could tell where the point of the nose should be (if that makes any sense). I really need to get started on more knit toys, though. I've used a bit of the yarn I dyed last week, and plan to make a few more outfits, and let them tell me what kind of toy I should make. Thanks, Amanda, for offering your ball winder, but I'm too impatient. Most of the yarn is already wound into balls, ready to use. Well, I guess I should make up kits more often! Those sure didn't last long. I need to order more books and yarn, but perhaps I will have time to put together a few more, even with making stuff for the craft fair. Now onto some fun toy action! Eve sent me some photos of this adorable little Westie. Apparently he started out life as a polar bear, but was proclaimed to be a Westie by her sons. 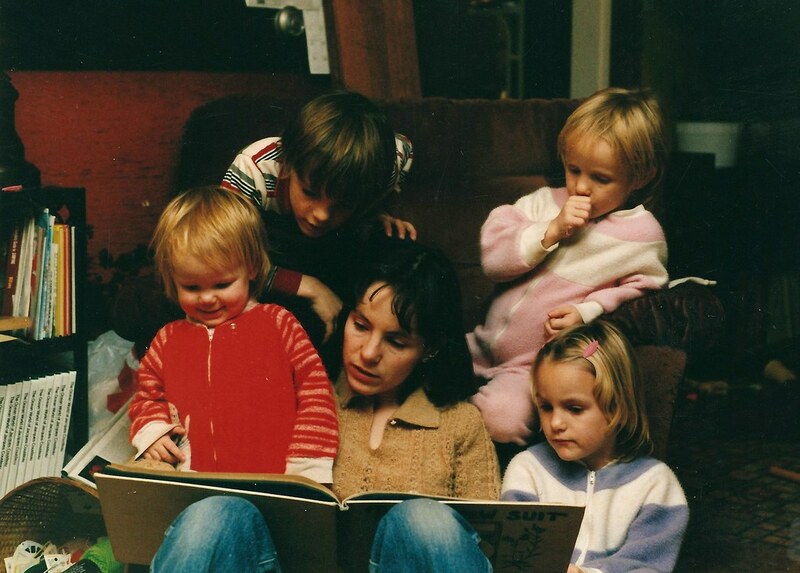 Everyone say, "Awwww." I love experimenting with different kinds of yarn, and despite the drawback of being polyester, eyelash yarn gives the toys a great effect. It makes excellent fluffy tails for squirrels and kitties. I've even used the shorter stuff to make a penguin. At the moment I'm working on a schnauzer using some fuzzy grey yarn (I'd share pics, but the camera charger is missing). If it wasn't so darned hard to make the nose with intarsia, I might consider writing out the pattern. I really should practice that technique more often! I've even been doing some knitting for myself lately. I finished a pretty scarf, just in time for the warm weather... oh well, it will be ready and waiting for me in the fall. I've also started Lucetta, a lovely lacy sweater. I took a chance on changing the yarn, and am knitting it in malabrigo lace in the pearl colourway. I'm so in love with this yarn! I had to knit the sweater one size larger, but otherwise everything is going fine using this yarn for this pattern. 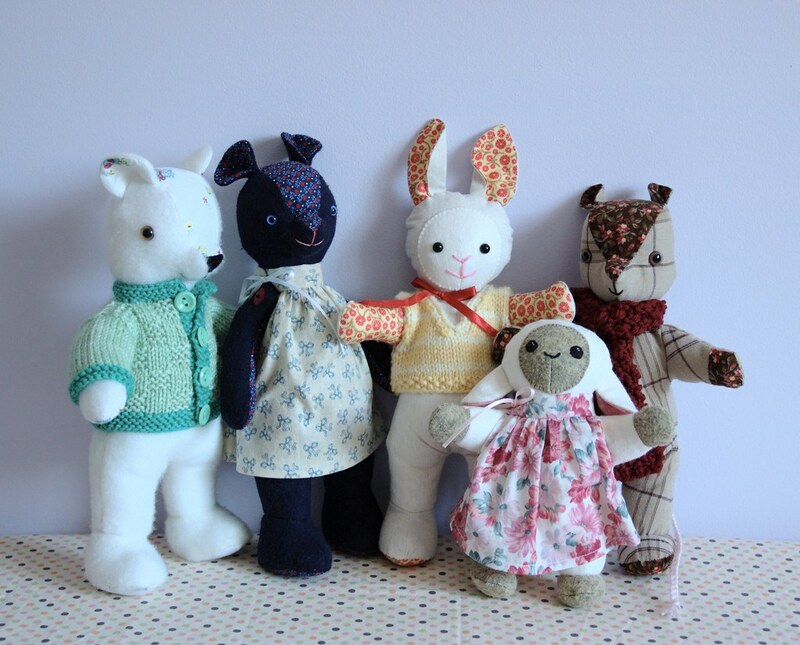 I was planning to save these kits for the craft fair, but I won't know if I've been accepted for 2 weeks yet, and I haven't put anything interesting in my shop for ages. There are three kits with tote bags, and one with a zipper pouch. All are for different toy patterns: a squirrel, a puppy, a monkey, and a mouse. Also, the bags and yarn colours are all different, so there's something for everyone. I would have liked to make more than four, but I used up the last of my Fuzzy Knits books and available yarn to make these. Looks like I'll be placing some orders and spending money here soon! If I don't get into the craft fair, there will be more things coming to my Etsy shop soon. If I do get in, well, I'll be making stuff like mad. But it's likely there will be left-overs, so that will all go to my shop after the fair in July. 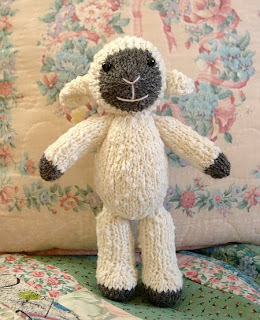 My fuzzy lamb pattern is by far the most popular. I like to think that it's not just because it's free! It does knit up into a cute and cuddly toy, and looks different every time because you can use so many different kinds of yarn for it. But who knew they might take on a life of their own, and inspired by their origins, begin to knit for themselves! I'd like to introduce Sheldon, created by Jennifer Adams. Sheldon is really in the zone too, knitting away at that garter stitch scarf. Maybe he's enjoying a knitting pod cast, or watching a movie, or listening to his knitting buddies chat about the latest to-die-for yarns. I'm in the process of revising all my patterns. Just little tweaks here and there, where I want to improve the shaping or make the instructions clearer. 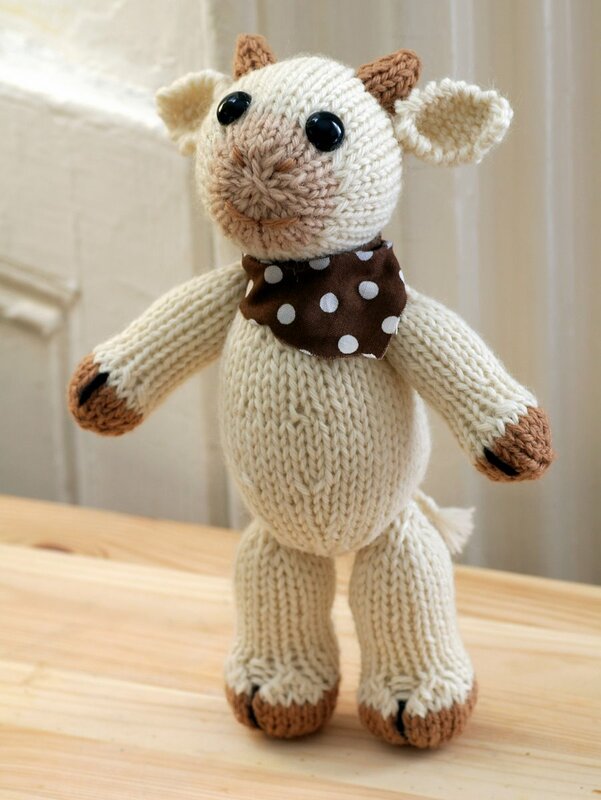 I'm also thinking of including a jumper with the free lamb pattern. Once it's all ready I'll let you know, in case you want to try the new version. But don't worry too much! The differences are so small you wouldn't notice in a photo. I guess there's just a touch of perfectionist in me. Here is another attempt at a fabric toy. I changed the feet, and I really like the shape of them now. They were also easier to attach, which was nice. Her face is quite cute, and the safety eyes are so much easier than stitching on tiny circles of felt. But I think the head might need a dart or two to make it a bit rounder. Her body is very squishy and cuddly, too. I was meaning to try jointed arms and legs next, but the cuddly bodies on these toys really appeal to me. Maybe I will end up making both versions, if the jointed toys turn out well too. 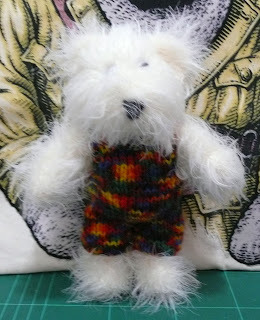 I thought I would try some fabric clothes for my knitted toys. I knit up this little kitty just to go with the dress. I was putting her together while my sister and niece were visiting this afternoon. My niece just loved the kitty! She kept trying to grab the toy from my hands, and shove it in her mouth. I even tried distracting her with the chicken and pig, but she just threw them down and looked around for the kitty. At seven months, she is really starting to develop a personality, and it's so fun to watch! The new clothing bundle is now available in both my shops. 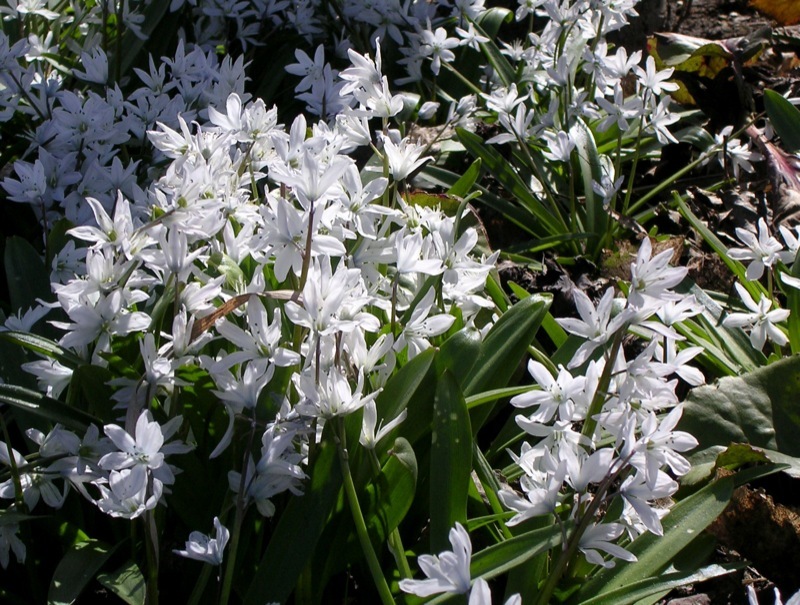 It took a bit of work to put all the patterns together - the word-processor I use is slightly temperamental when you start doing complicated things like inserting photos. I'm planning to replace the individual clothing patterns in my Etsy shop with the bundles, and have two there already. I know it was probably nice to buy just the individual clothes patterns, but after all the fees are paid, I don't really make any money on them. I hope you understand. Besides, the five patterns together are a pretty good deal! Well, that's it for now. Back to knitting!